I will visit the Leptin Lab at EMBL with Historian of Science Janina Wellmann for one week to study cell formations in gastrulation (early embryogenesis) with specific focus on drawing and movement as modes of enquiry. Lively exhibition talk at the Exchange Gallery ranging from music of the spheres and wisdom traditions to to cell division and pluralism- with artist Serena Korda, cell biologist James Wakefield and Camden Arts Centre curator Gina Buenfeld -‘GÄA: Holistic Science and Wisdom Tradition’ is now open! Press Journals – with Mathematician Berta Verd and Biologist Johannes Jaeger. Delighted to have historian of Science Janina Wellmann and Bio-Artist Anna Dumitriu as guest speakers for the first Art Science Interest Group meeting of 2019. Blog post to follow. *Founded in 2016 by Artist Gemma Anderson and NHM Scientist Gavin Broad, the Art and Science Interest Group (ASIG) at the Natural History Museum is a bi-monthly forum that fosters a community of Scientists and Artists who are interested in the field of ‘Art/Science’. ASIG provides a programme of Invited speakers at each meeting, who share practice and ideas and excite new conversations in the group. Speakers: Dr Chiara Ambrosio (UCL) and artist’s Caroline Ward and Michiko Nitta present their work followed by group discussion. Gemma Anderson talks about the AHRC project ‘Representing Biology as Process’ – Lecture open to BA and MA students and staff at PCA. to work on drawing and modelling phyllotaxis and leaf shape in plants. Conference Presentation at the Society for Philosophy of Science in Practice: ‘Representing Biology as Process (+Re-presenting Process)’ Alternative format session. This session developed out of our interdisciplinary project involving an artist (Gemma Anderson), a cell biologist (James Wakefield) and a philosopher (John Dupré). The overall goal of the project is to develop better ways of representing biological processes. It also continues earlier work by Anderson (2017) on drawing as a way of knowing. As Wakefield will argue, the decline of drawing as a practice in biological research has had deleterious consequences for some aspects of biological research. In the first stages of the project, Anderson and Wakefield have worked together to produce images of mitosis, the process that is the central research topic of the Wakefield lab. The aim was to produce a two-dimensional image that somehow represented the full sequence of transitions involved in mitosis. A method was developed that translated Wakefield’s understanding of mitosis into an image in which the vertical dimension represented time, and a number of features (colour, thickness of line, distance from the centre, etc.) represented crucial aspects of the mitotic process. A number of different images have been generated, representing different organisms with differences in their processes of mitosis. The process of producing these images and its rationale will be presented in fuller detail during the session. The outcome of this activity has been a series of images, which we refer to—for reasons that will be obvious on seeing them—as mitosis pots. These are, perhaps needless to say, very different from familiar textbook depictions of mitosis. The causal connection between features of mitosis and features of the mitosis pots gives us confidence that the images could be used to represent common features and specific differences in mitosis, though it is also clear that such use would require a degree of training. We shall discuss the costs and benefits of introducing such images into the practice and teaching of biology. Preliminary exploration of this question has involved soliciting reactions from other scientists. We feel that a standard format of three 30 minute presentation representing distinct disciplinary perspectives would not do justice to the interdisciplinary nature of the project. Instead, we propose three brief introductions to aspects of the project by each of the participants, followed by more detailed presentations of the first completed sub-project, which is collaborative work by Anderson and Wakefield. We will allow some time for discussion at the conclusion of each part of the session. Dupréewill also chair a concluding 15 minute discussion session. Gemma Anderson has been invited by the Society of the Philosophy of Information to create a workshop about ‘drawing information’ at their meeting on the 26th and 27th June 2018 in Brussels. From anatomical studies to the biomorphism of surrealism and the abstractions of Klee and Kandinsky, the biological realm historically provided a significant resource for numerous artists while many scientists like Haeckel and Hooke produced works of artistic merit. This course focuses on the twin themes of morphology and drawing through an exploration of intuitive and experimental drawing methods. The aim is to develop and share new ways in which drawing practice can enhance morphological insight, specifically within the contexts of art and the natural sciences. Central to this is Goethe’s concept of morphology, which he defined in 1792 as ‘the study of form and formative process’ (Goethe and Naydler 1996) combined with a narrative of the development of ‘drawing as a way of knowing’ in my own artistic practice. The path of the course arcs from observation to abstraction as a range of morphological drawing methods will be tested through a series of practice-based workshops using drawing as a method to investigate in diverse contexts; from fieldwork and microscopy to classification and simulation. We explore the relationship between art and biology through artists, scientists and thinkers such as Goethe, Klee, Waddington, Thistlewood and Mundy. As part of a wider cultural movement in Art/Science and STEAM, this course will highlight historical and contemporary of practices towards the development of independent investigations in Biology and Art. 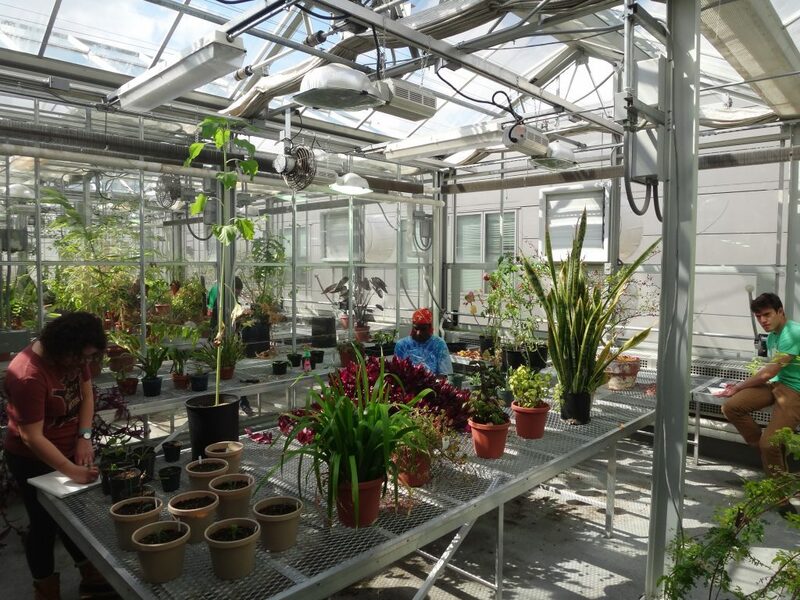 ‘I have left this class with a reinvigorated perspective on Biology and Nature in general. I find myself more attentive to forms and similarities among plants, especially.I also plan to exercise a lot more care and precision with my drawings. Our discussions on bias and our practical exercises on drawing from observation, made me realize just how extremely DIFFICULT it is to accurately capture an organism on paper, and how much skill it takes to be keen at observational drawing, being able to distinguish and incorporate details, patterns, textures, and lines in an unbiased and informative way’. Making Life Visible explores the processes of visualization and description in art and biology by featuring work by 16 contemporary artists and scientists, as well as historical material from the 16th to 19th centuries. In the past, biologists and artists had similar training in observation and drawing. Though the fields have diverged, individual practitioners on both sides continue to draw inspiration from one another, finding new ideas in the process of creating images. The exhibition asks: what do artists and biologists see, and how do their ways of seeing challenge and stimulate one another? 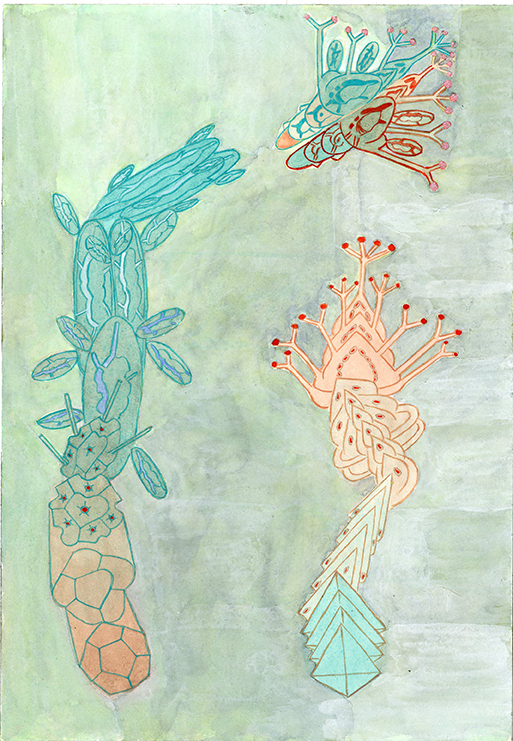 Subjects addressed in the exhibition range from molecules and cells, to organisms and ecosystems, and the artists/scientists work in labs, studios, museums, and in the field. Founded in 2016 by Artist Gemma Anderson and NHM Scientist Gavin Broad, the Art and Science Interest Group (ASIG) at the Natural History Museum is a bi-monthly forum that fosters a community of Scientists and Artists who are interested in the field of ‘Art/Science’. ASIG provides a programme of Invited speakers at each meeting, who share practice and ideas and excite new conversations in the group. At the NHM, the Centre for Arts and Humanities Research (CAHR) has promoted interdisciplinary collaboration, but its future is currently in doubt. By collaborating with scientists at the NHM and contributing to Art-Science events with drawing workshops, and with the final ‘Representing Biology as Process’ project conference hosted at the NHM, we aim to sustain and cultivate the arts-science museum culture. *ASIG NHM webpage is forthcoming. 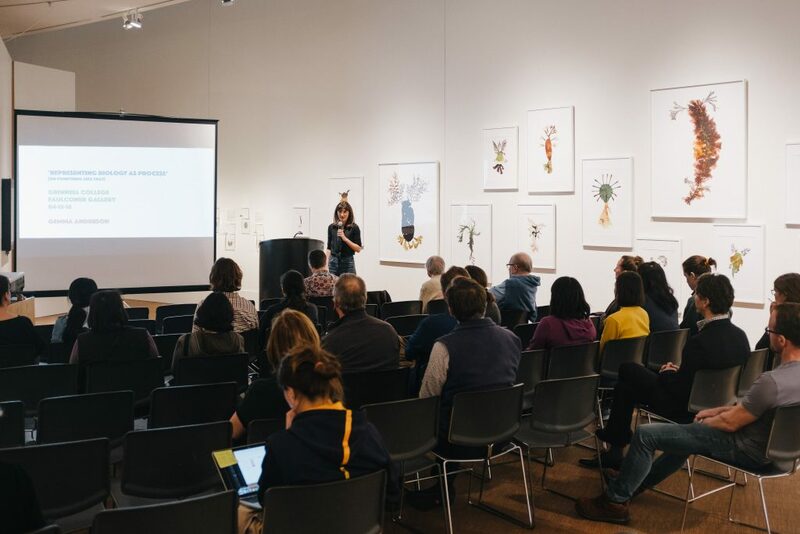 ‘Artist in residence Gemma Anderson will introduce her work at Grinnell in the context of the current collaboration with biologist James Wakefield and philosopher of biology John Dupré on the Arts and Humanities Research Council project Representing Biology as Process (2017-2020). Dr. Anderson has collaborated on a number of innovative art/science projects including Hidden Geometries with the Mathematics Department at Imperial College London; Isomorphology with the Natural History Museum, London; and Portraits: Patients and Psychiatrists (Wellcome Trust Arts Award 2009) in collaboration with psychiatrists and patients at Bethlem Royal Hospital. Co-sponsored by the Institute for Global Engagement and the Biology Department’ . In response to the need for a format to show the transdisciplinary research project ‘Representing Biology as Process’ beyond the art-space, this is the first experiment with a flexible and mobile modular structure for exhibiting work in academic and scientific spaces. The structure has been inspired by the Institute of Contemporary Art (ICA) exhibition ‘On Growth and Form’ (1951), especially Richard Hamilton’s experiments with ‘plane-by-plane’ constructions organised around a modular hanging system with the intention to give viewers an opportunity to generate their own image relations in space. The grant application for the project “Representing biology as process” has been awarded funding. The project, based at the University of Exeter, will be led by Prof. John Duprè, with Dr. Gemma Anderson and Prof. James Wakefield as co-investigators. The project will run for three years until 2020. Updates on the project will be published on the project website www.probioart.uk and The Big Draw website, where it was introduced. On-Growth-17On-Growth-17I am co-organising this workshop at Lorentz Center, Snellius, Leiden, Netherlands, Monday 23th – Friday 27th October 2017. 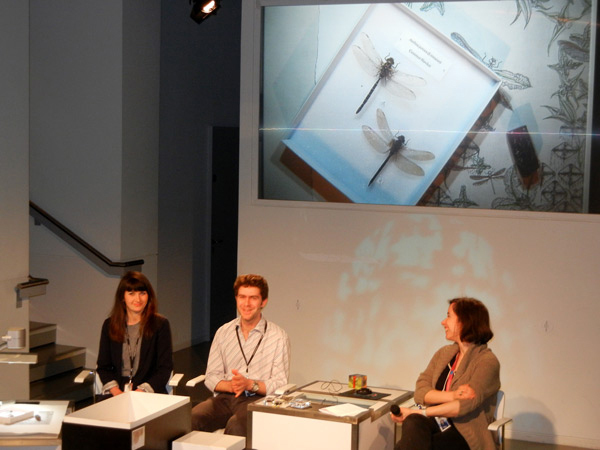 Invited Artist talk for the event Ordering Nature: Fabulous Alternatives, part of “Making Nature: How we see animals”, jointly organised by Wellcome Collection and Grant Museum of Zoology, London. This first residence opens a collaboration with KLI, an international research centre for the advanced study of theoretical biology in Vienna, that we expect to develop further in 2017. ‘Beyond Impact: Drawing as a way of knowing in Biological Sciences’, Keynote Lecture, ‘Creativity in Science Teaching’, Society for Experimental Biology, Charles Darwin House, London, 12-14th December. Artist talk by first artist-in-residence of the Northern Ireland Science Festival, Gemma Anderson. Gemma talks with Niccolò Tempini, at Naughton Gallery from the exhibition ‘Drawn Investigations from Art and Science’. Dr Gemma Anderson presents drawing as a way of knowing for art and science to extend the understanding of, and engagement with, the diversity of natural form. Dr Anderson focuses on how she developed this practice and explores some current research projects. This lecture was filmed at the Society for Experimental Biology on the 13th December 2016.